You are currently browsing the archives for the New Products category. Unlike competing modular sport surfaces, which apply thin films and painted coatings, which tend to easily wear and peel, TuffShield incorporates a multi-patented, 100% in-mold technology for unmatched durability, quality and consistency. “The feedback from sport facility managers, coaches and players has been incredible. The players and fans love the play and look of this system. Year after year, our team is committed to developing the industry’s best and top performing products, and I am proud to say they knocked it out of the park again with TuffShield Maple. ” – Jorgen Moller CEO of SnapSports, Inc.
SnapSports®, recognized as the worlds leading manufacturer and supplier of premium athletic surfaces, is no stranger to innovation in the sports flooring world. SnapSports continues to introduce the industry’s leading performance sports flooring products year after year. SnapSports Athletic Floor offerings include both commercial and residential outdoor multi-courts and indoor gymnasium surfaces. Some of SnapSports’ exclusive technologies include ShockTower® – a full-suspension floor system with 16 resilient shock absorbers per square foot, inserted into the sub-structure, providing an added level of “cush” to reduce impact on athletes joints and limbs during play; ShockLock® – an interlocking system which lets individual modules slide during impact, but keeps the entire sport surface fully engaged. This built-in “give” eases player joint impact and creates a safer athletic surface; BounceBack® – a full-suspension modular flooring system with an understructure that performs as a high impact shock absorber, reducing fatigue and injury to athletes. Each square foot of BounceBack weighs in at over one pound, stands ¾” tall and contains nearly 1,200 shock absorbing support towers. It is the industry heavyweight. SnapSports Inc. was awarded two US patents for their DuraCourt and BounceBack sports surfaces. The first patent covers the multi-level, slip-resistant surface of the DuraCourt flooring. The second applies to the lateral locking and Dual Suspension® systems of the BounceBack flooring. “We believe we make the best modular sports flooring available today. Our unique patented designs have exceeded the expectations of our customers all over the world,” said Jorgen Moller, CEO of SnapSports. BounceBack, a ¾” flooring system, has the highest shock-absorption rating of any modular sports tile. Its ShockLock® and Dual Suspension® systems allow for greater impact stability and support heavier rolling loads. The under-structure of the BounceBack provides a “cush” effect and increases ball response in sports like basketball and volleyball. DuraCourt, a 5/8″ tall outdoor modular sports surface, is more rigid and impact stable for multi-sport games like inline hockey and tennis. SnapSports®, the world’s largest manufacturer of premium athletic surfacing and game courts, will introduce their BounceBack ShockTower® court surfaces to the parks and recreation industry at the 2009 Recreation and Park Association’s Annual Congress. The event will be held in downtown Salt Lake’s Salt Palace Convention Center. A half court basketball court will be featured in the center’s reception area and a full outdoor court will be displayed outside the convention area. “We make it our mission to stay on the leading edge of our industry. When we were asked feature or ShockTower indoor and outdoor basketball courts at this year’s NRPA, we were not only honored, but felt it was a great opportunity to exhibit our advancements to a leading advocacy organization like the NRPA,” said Jorgen Moller, CEO of SnapSports®. The NRPA Congress begins today and runs through Saturday. Founded in 1965 through the merger of five national organizations, the NRPA is dedicated to the advancement of public parks and recreation. 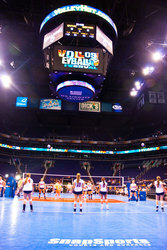 SnapSports, the industry leading manufacturer and provider of premium modular sports surfacing and game courts, was the premier championship flooring for this year’s Volleyball Festival championship games played in the US Air Arena in Phoenix, Arizona. Every year since 1984, Festival Sports has put on the largest volleyball tournament in the world, Volleyball Festival. This year over 500 teams from around the world, consisting of girls ranging in age from 12-18 came together for 2 weeks to play thousands of games on hundreds of courts. “We can’t express how thrilled we are to be apart of this world class event. To have our athletic surfaces chosen as the championship court for the Volleyball Festival tournament is a tremendous testament to the quality and high performance features of our sports flooring,” said Jorgen Moller – CEO SnapSports. The SnapSports surface the athletes competed on is the industry’s most advanced suspended modular sports flooring. The BounceBack® ShockTower™ surface has multi-patent design features including the new ShockTower™, the resilient shock technology which offers excellent impact control and rolling support for added player safety and superior ball response. SnapSports Athletic Surfaces, the industry’s leading manufacturer and supplier of modular athletic surfaces, introduces their all new multi-patent pending BounceBack ShockTower™ sports surfacing. The BounceBack ShockTower is sure to revolutionize the modular athletic surfaces industry. This unique modular athletic surface was engineered with a ReactivePlay™ energy return technology. The patent ReactivePlay system provides superior ball response and more power to the player as well as delivers an added level of absorption to reduce impact on joints and limbs. The sixteen individual contact points in the understructure ensure a consistent playing surface and excellent coefficient of friction to keep the surface in place. This new engineering design eliminates the necessity for any heavy rubber underlayment. “The testing results and player feedback on the BounceBack surface have been remarkable. There is no other surface in our industry that can out perform this sports flooring system,” says Jorgen Moller, CEO SnapSports. The BounceBack ShockTower installs easily and was developed with an innovative locking system, The ShockLock®. The ShockLock allows the interlocking modules to freely slide laterally reducing the impact to the athlete’s joints. The design of the locking system stays fully engaged during play and is engineered to help reduce injury and provide safety to players. Safety and performance are always a top priority in the designs of SnapSports floors and the ShockTower is a modular flooring system that will change the industry forever.